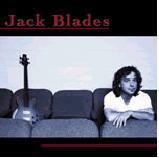 Well, well, a solo album from Jack Blades, the bass player/vocalist of AOR giants Night Ranger and Damn Yankees. Both of those bands made some damn good rock tunes and power ballads in their time. Wonder if Jack dished out any good stuff under his own name? Many top players from Americas arena rock scene make guest appearances on the album, from Blades´ Night Ranger – band mates Jeff Watson, Brad Gillis and Kelly Keagy to Journey´s six-string master Neal Schon and Styx/Damn Yankees guitarist/vocalist and long time collaborator Tommy Shaw, among others. The music is radio-friendly rock throughout the album, but unfortunately most of the material doesn´t hold a candle to the material of Blades´ earlier bands. Blades sings as good as he ever has. He sounds just like he does on recordings from 20 years ago, no loss there. His voice suits material like this very well, not too rough by any means, but with a little rocking edge. The problem is that most of the songs lack any kind of edge. The starter of the album, Sea Of Emotions, is a nice rocker with a great melodic solo courtesy of Schon. The next cut, Shine On, takes a huge dive in comparison. It begins with some nice eastern flavoured guitar licks, but the lyrics plunge the tune to a swamp of clichés. Call me cynical and heartless, but a chorus like: Shine On, baby we will always be together. Shine On, you and me were meant to be forever makes me feel like a pancake dipped drowning in a pool of maple syrup. Even the nice wahwah-powered solo doesn’t save it. To Touch The Sky and On Top Of The World are two quite solid rock tunes, with the latter having a quite heavy riff – at least compared to the rest of the album. On Top is easily the best tune of the album. It even has a nice dirty-feeling groove in the verses, which bring this album a lot of points. I must also mention the solo on To Touch The Sky, which is awesome and very melodic. Even some metalheads might get some kicks out of it. The rest of the songs are acoustic based ballads or mid-tempo pop-rockers. Breaking It Down stands out from the ballads on the record, but unfortunately no super lighter-raisers like Sister Christian or High Enough can be found here. The best way to describe songs like Sometimes You Gotta Have Faith or Someday would be this: If you heard them in the background of Dawson´s Creek or any other “high school drama”, you probably wouldn’t raise an eyebrow. They are well made tracks, but they just lack edge crucial to this kind of pop-rock to really stand up from the mass of radio play. The production is clear, but not overtly polished. The drums could have used a bit more power, now they get buried too often in the mix. This album probably would not disturb anyone. Radio Rock made with skill. The music is nicely rocking from time to time, but the lyrics are mostly terribly used and full of clichés. If you want simply heavy grinding and pounding aggression, this album has very little for you. If you want some relaxing rock to put in the background while sharing some nice moments with your loved one (DAMN, I´m starting to sound like a sappy romance novelist here, gotta crank some Pantera after this, FAST) or just want to play some well done pop-rock, give this one a try.